Find the GEOPRACTIE on a "sister" page of your site geopractie.com. DOMINIQUE MOUNIE will soon be visiting Australia for several conferences. if you are followed by misfortune, move to a different house. 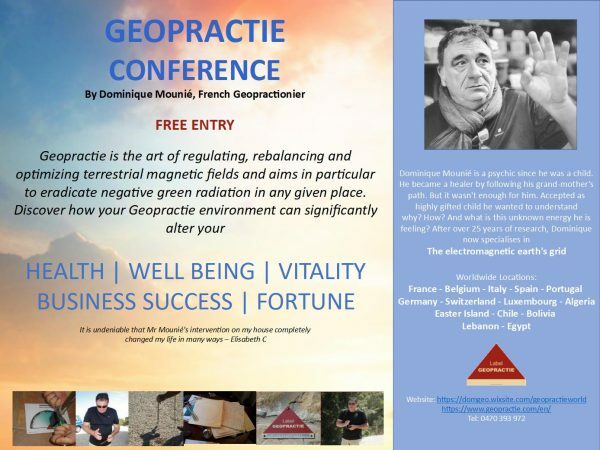 Geopractie is the art of regulating, rebalancing and optimizing terrestrial magnetic fields and aims in particular to eradicate negative green radiation in any given place. Private persons, industrial companies, traders, entrepreneurs, architects and promoters may use Geopractie, which will be of great benefit for their physical and mental health and for the long-term prosperity of their businesses. You feel concerned ? Want to know a little more about Geopractie ? Do not hesitate to contact us using our form. We will be happy to assist you.